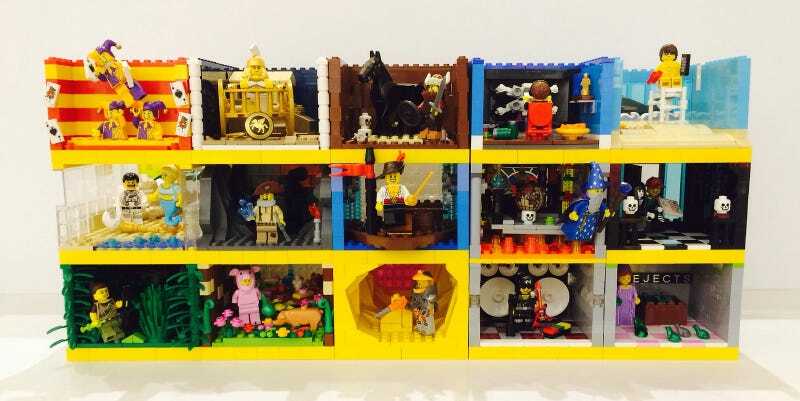 The Toronto Lego User Group (ToroLUG) has shared the habitats that they build for each series of collectible minifigures. Each time a new series is released, their Lego user group gets together and builds vignettes on a 12x12 base for each of the new figures. The habitats have been featured at several Brickcons, building events and in the Lego brand store. Here are some close-ups of ToroLUG member Mel's contributions to the above collection. Lifeguard - Super awesome use of the Unikitty tail for the waves here. Battle Goddess - This is a great little build. The forced perspective on the Greco-Roman temple in the background is cool. You can see a compilation of Series 1-11, Lego Movie, Simpsons and the Team GB Olympic figures here.